include Social network profile like Facebook, twitter and Rss with Google custom Search box. 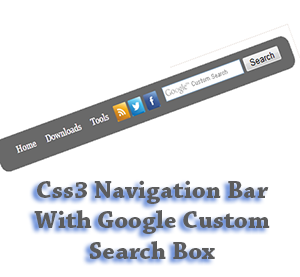 This Css3 navigation work fine with every modern internet browsers.You can link with your main pages by using this Css3 navigation bar.Im using Css3 and HTML Just check out demo.Its easy to add to blogger.lets give a try. Replace # with your links. Hope this Css3 Navigation Bar helps to make your blog attractive.Leave a comment, if you need any help regarding this menu.